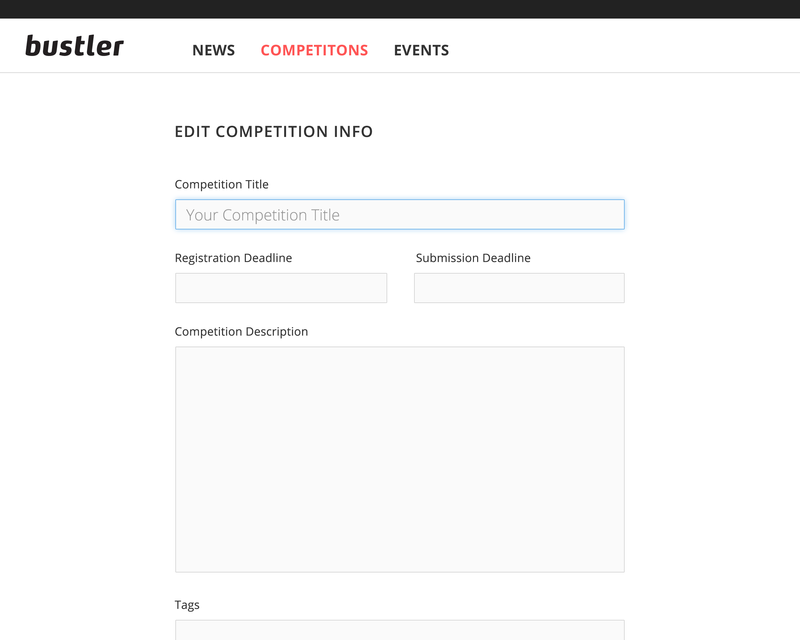 Competitions can be submitted as either free entries (BASIC) - or - paid listings (STANDARD or FEATURED). 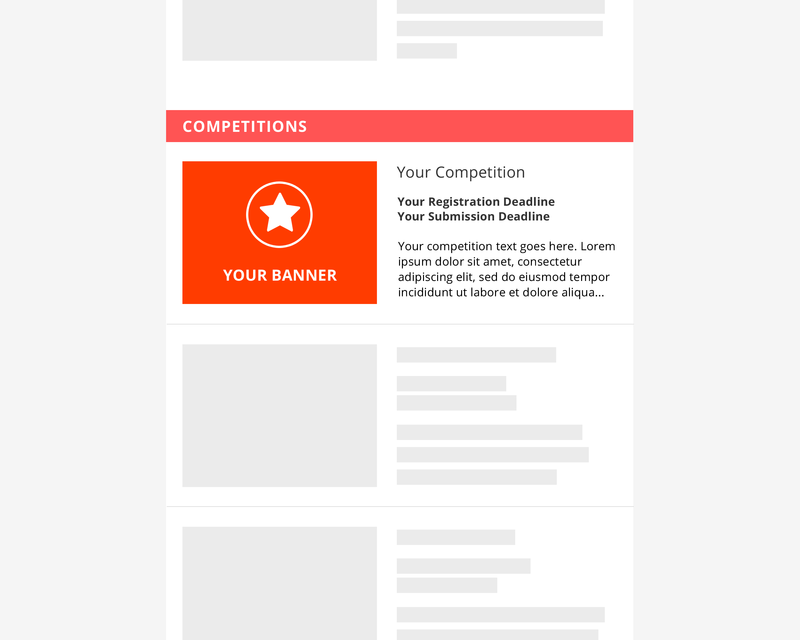 All free submissions will be reviewed by our editors first. 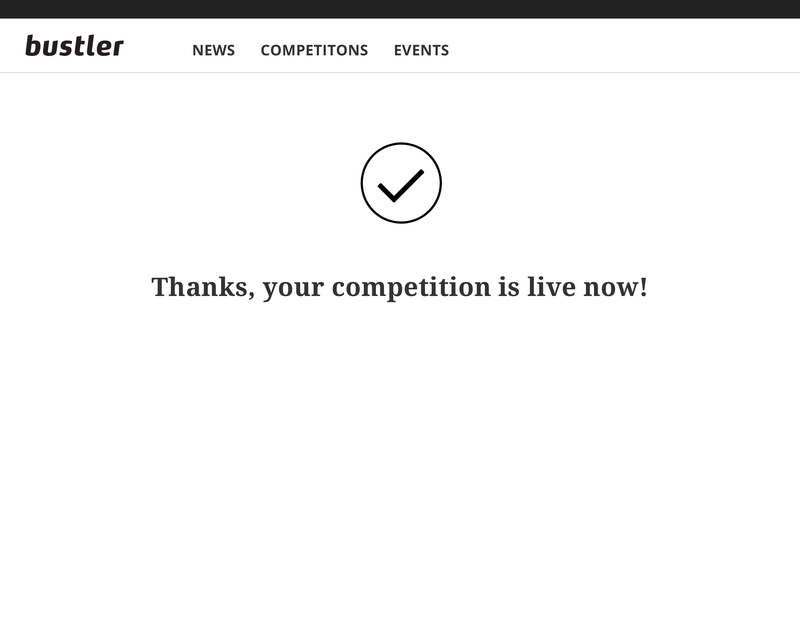 To maintain the high quality of competitions listed on Bustler, we are extremely selective with the submissions we accept as free listings. 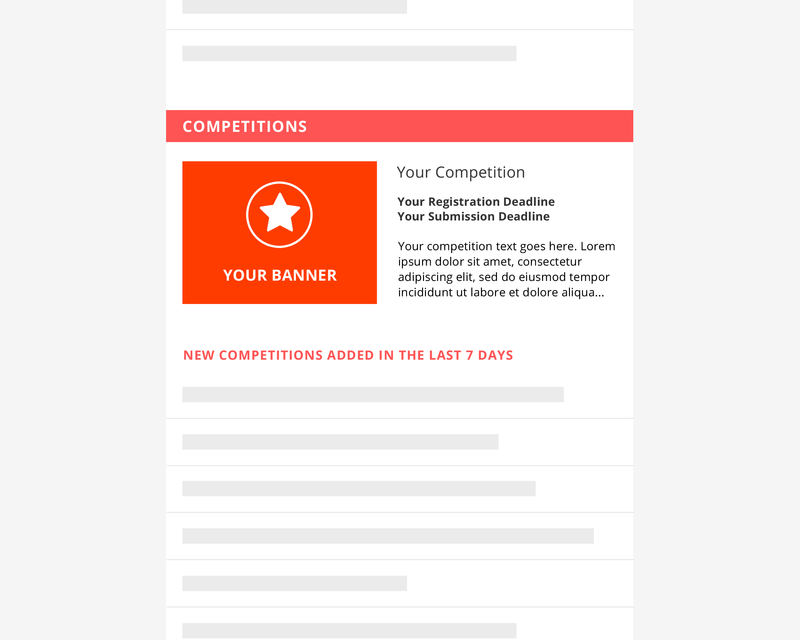 To ensure your competition gets added to our list right away, please consider submitting it as a paid entry via the STANDARD or FEATURED option. 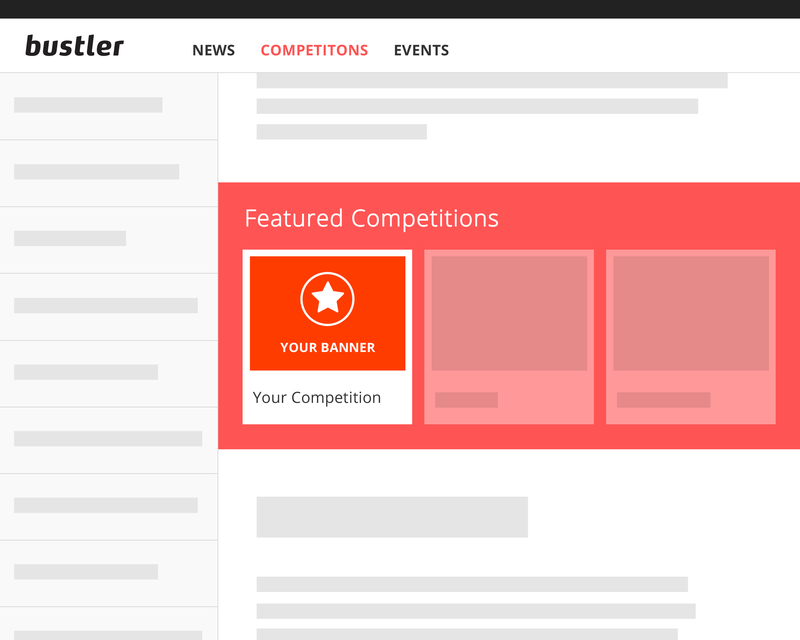 Want to advertise your competition with dedicated news posts and/or social media blasts? 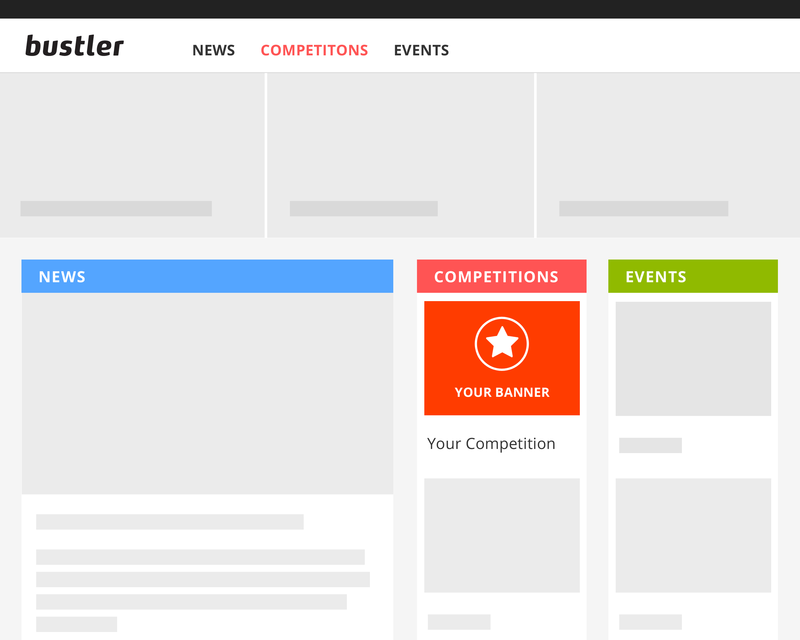 Our comprehensive ad campaigns bring your competition in front of Bustler's huge, global audience. Contact us to learn more about campaign options and rates. 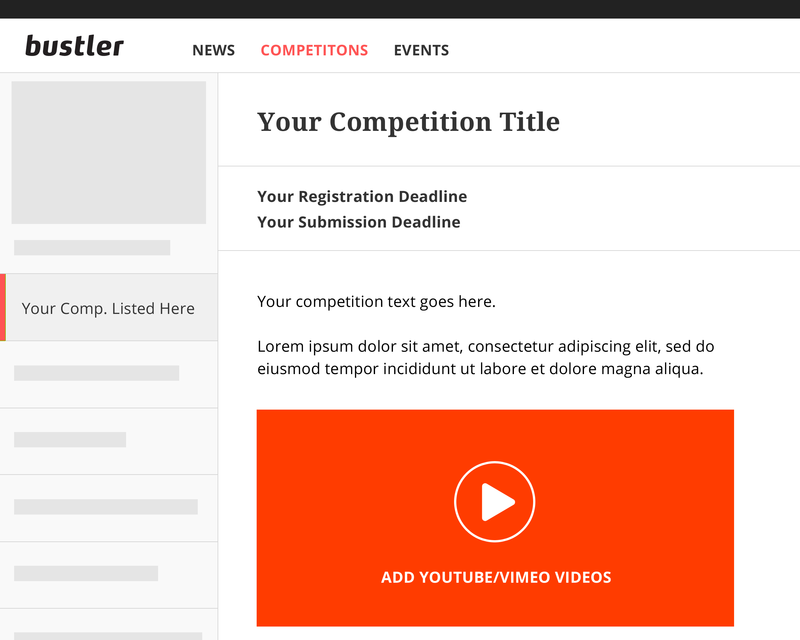 1 Listing banners will appear throughout the site in four prominent locations (Bustler homepage; Competitions landing page; Competition list; Competition listing and News article dividers). 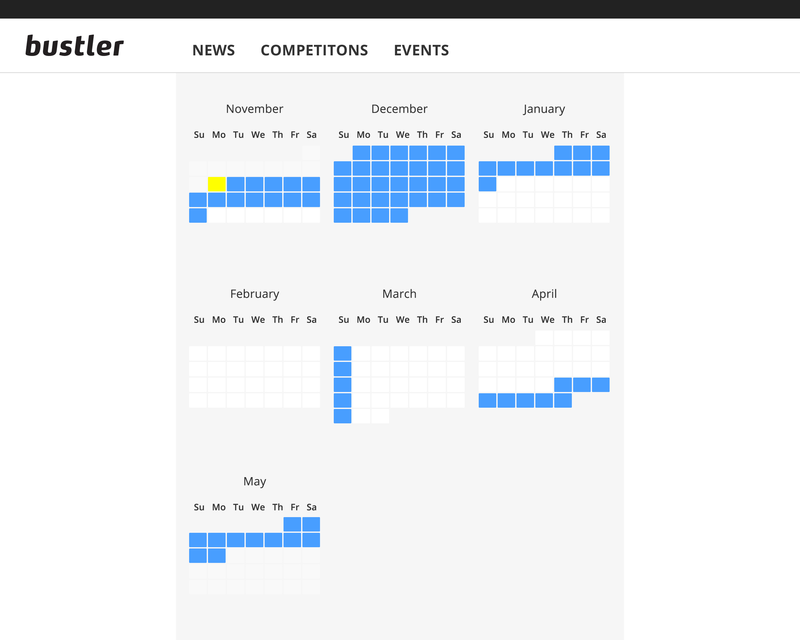 Where will my competition banner be displayed? 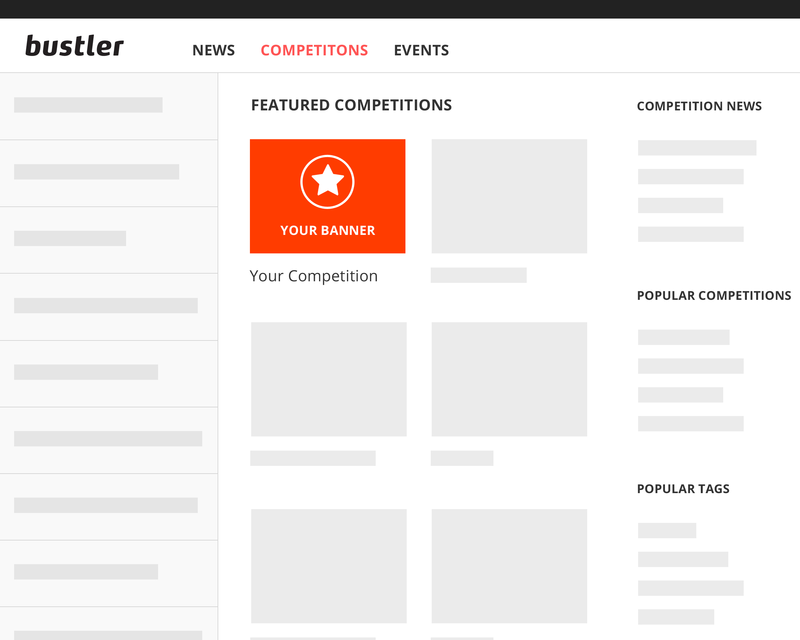 Competition banners will be displayed on the homepage, in the sidebar of all subsequent competition pages, on the competitions landing page, in dedicated dividers between articles and competition listings, as well as in the Daily newsletter. 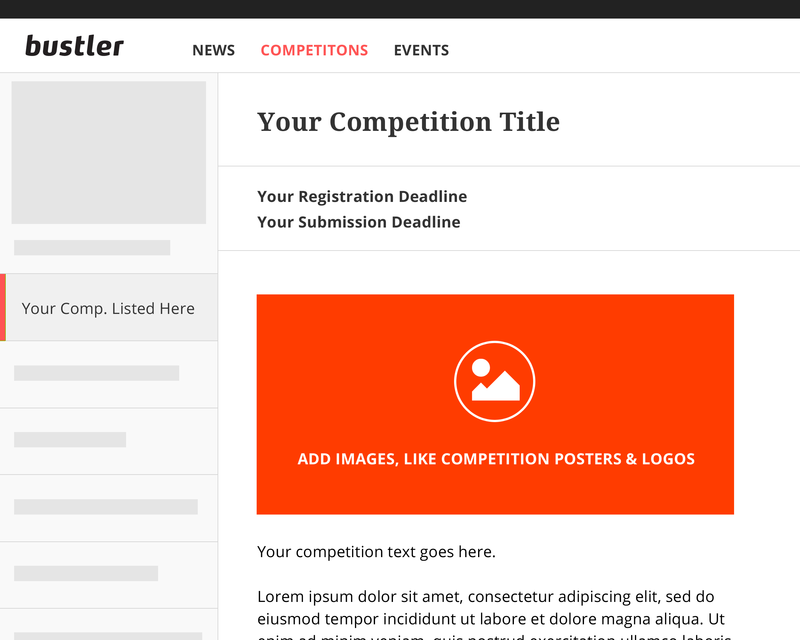 The Featured option also gets your banner up in Bustler's popular Weekly newsletter from the time of posting until the listing expires. 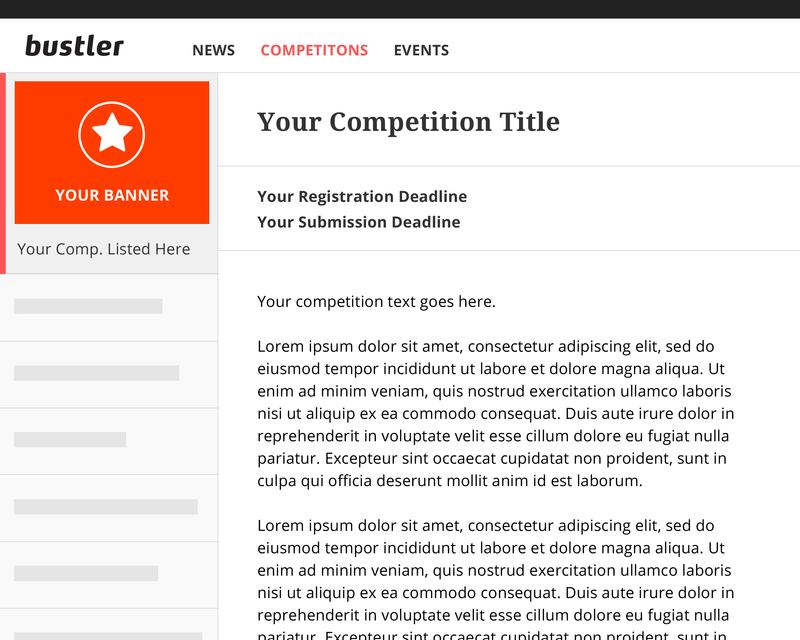 Can my banner click directly to my competition website? 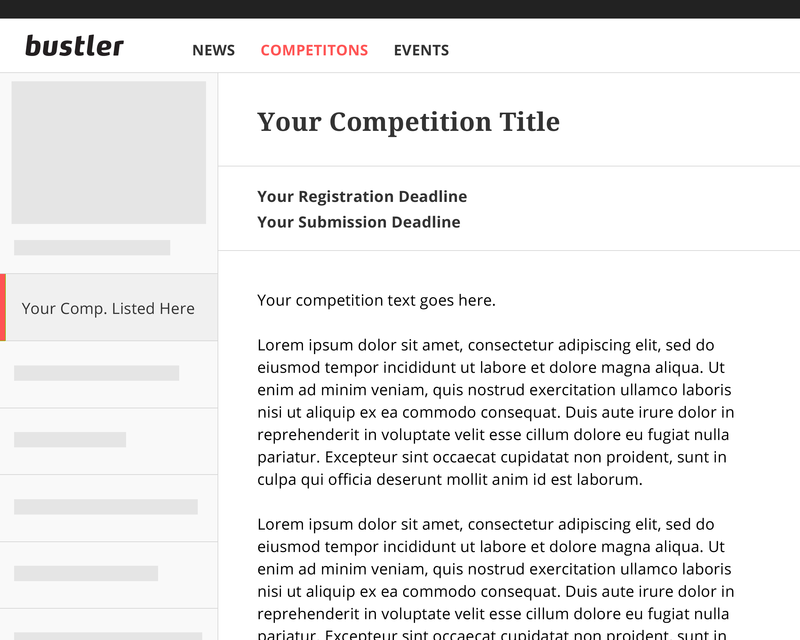 Listing banners will appear throughout the site in four prominent locations (Bustler homepage; Competitions landing page; Competition list; Competition listing and News article dividers) as well as in the Daily newsletter.